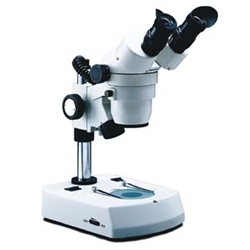 MW5-L5 binocular and MW5-L6 trinocular stereo zoom microscopes on pole stands provide three-dimensional images that remain in focus throughout the zoom range. Optional eyepieces and auxiliary objectives expand magnification range and working distances. Objective Lenses: 1x - 4x objective - provides continuous zoom magnification. Viewing head rotates 360°. Eyepieces: Your choice of paired widefield 5x, 10x, 15x or 20x eyepieces that are 45° inclined, with dual diopter adjustments, interpupillary adjustment from 55mm to 75mm. Accepts 23mm diameter eyepiece reticle. MW5-L6 trinocular version has a beam splitter which allows the light from the left eyetube to travel to the trinocular port for better camera light. Trinocular version comes with both a C-Mount adapter and an SLR adapter. Total Magnification: Zoom range of the following: Please view the Magnification Chart for complete details on working distance and field size at different magnifications. Specimen Stage: Two 80mm diameter stage plates (black and white plastic contrast plate and frosted glass stage plates). Includes blue filter for transmitted light and locked on stage clips. Stand: Professional all-metal frame with heavy-duty post mount. Includes locking support collar that permits up or down adjustment of viewing head to accommodate different sized objects on stage. Focusing: Rack and pinion focusing with large dual focusing knobs with slip clutch to prevent damage to the mechanism. Tension adjustment eliminates focus 'drift'. Illumination: Top light is 12v 15 watt halogen, bi-pin with directional beam and rheostat control. Bottom light is 110v 5 watt fluorescent for cool operation, greater light efficiency. Lights can be operated independently of each other. Size & Weight: 13 3/8 " high, extends to 17" for larger objects. Maximum specimen height with no auxiliary lens is 93mm. Weight - 11.7 lbs. Warranty: Lifetime limited warranty, excluding bulb, cord and fuse.